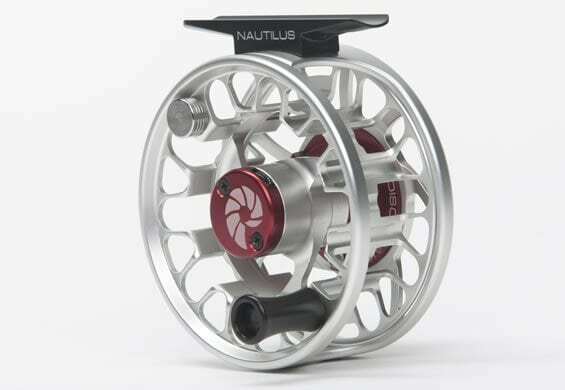 The Nautilus FWX (Feather Weight Xtreme) series is the most technologically advanced and the lightest machined aluminum disc drag trout fly reel on the market. FWX 3/4 WF-3F +120 yds #20 3.6 0z. FWX 7/8 WF-7F +225 yds #20 4.1 0z. Like the NVG reels, the FWX sport our Giga arbor spool design that promotes faster line pick up and backing drying. In addition to the advanced spool designs used in these reels, we have added a new stainless steel 1-way clutch that is housed in our proprietary TORQ-XTM clutch drive that ensures instant drag engagement with no slack. The retrieve direction can be easily switched from left hand to right hand and the spools are easily changed with a push on and click off release. One of the most popular creations to come out of the Nautilus think-tank is the industry first LaserIDTM line identification system: We have laser etched a white spot on the back of each FWX spool to write the line type and weight that you are using. Write with a permanent marker and wipe it off with alcohol when you change lines. No more washed out or lost line stickers. 9 lug reinforced clutch for instant drag engagement.